MacGyver was the greatest TV shows of all time, yes? Yes. But so much of it only exists in memory now. Or did, until someone came along and catalogued every single awesome thing Mac ever did, in convenient interactive form. 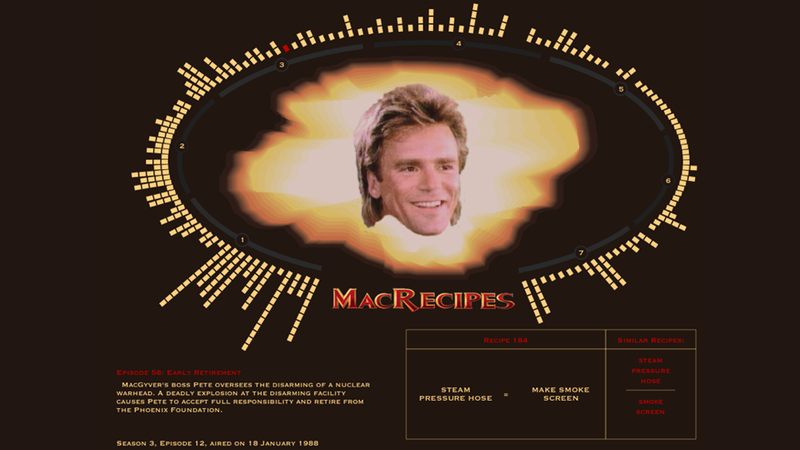 What kind of trouble can you get in at MacRecipes? Sort by everything from how he made that bomb in Season 1, Episode 7 (cotton wool + engine starter fluid + fertilizer) to how many times over seven seasons MacGyver used a paper clip to get out of a scrape (only three!) to which episode crammed in the most DIY badassery (a tie between Season 1, Episode 4 and Season 1, Episode 12).